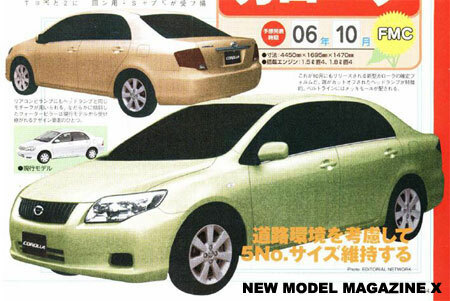 Reader KH Chee sent in these scans from a Japanese car magazine “New Model Magazine X” showing how the new 2007 Toyota Corolla could look like. There seems to be two grills, one a horizontal bar grille and the other a vertical bar grille similiar to the one found on the Toyota Harrier. 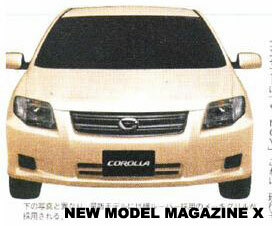 This is apparently the JDM model, and according to the magazine it will make it’s debut in October 2006. At 4450mm x 1690mm x 1470mm, the car is slightly smaller than our Toyota Corolla Altis which measures 4530mm x 1705mm x 1480mm. The car also looks like its lost some weight. The Toyota Corolla Altis was originally developed for those who wanted a larger and more luxurious car than the Corolla, but did not want to get a Toyota Camry. This might be the new Corolla that we are going to get, or we might get another new Corolla Altis version which is bigger and more luxurious. Which explains the shrinkage in dimensions. The USDM Toyota Corolla uses the Toyota Corolla Altis model, not the Toyota Corolla. Anyhow, speculation is exactly that – speculation. Enjoy the photos.